This page has 2 good rotational core training exercises to include in your core workouts. If you start focusing on core workouts, you might find that your posture improves and you may feel less lower back pain. The exercises below may look easy, but they help to develop the stabilizer muscles that do not get as much exercise when you use machines. This core exercise is great for strengthening your spine and improving the mobility of your spine. Starting Position: Begin by balancing on your right knee and left hand. Extend your left leg back but keep your foot on the floor for added balance and stability and place your right hand behind your head. Form: Use the drawing-in maneuver to engage your abdominal muscles and stabilize your spine. After engaging your abdominals, twist your upper body and rotate your right elbow towards your left elbow. Touch your right elbow to your left elbow, and then return to the starting position. Personal Trainer Tips: Move in a slow and controlled manner. Attempt to touch your elbows, but if you cannot just go as far as you can comfortably move. Perform 8-15 repetitions on one side and then switch to the other side. This is the second level of the above exercise. It is performed in a similar manner. The difference is that the back leg is lifted off the floor. When you lift your back leg you decrease your base off support, your core muscles must work harder to keep you stable. Starting Position: Begin by balancing on your right knee and left hand. Extend your left leg back and keep your leg lifted off the floor and in-line with your body. Place your right hand behind your head. Perform 8-15 repetitions on one side and then repeat on the other side. These are great core training exercises. One of the main benefits is mobility and flexibility in the spine. It is important to exercise your spine in all directions, and incorporating rotational exercises in your core workouts will help to keep your spine balanced. If you sit at a desk for work, this core exercise can help to decrease stiffness in your lower back and strengthen your core muscles at the same time. Including rotational exercises is your workout is an important core training tip. Click to learn 14 Additional Core Training and Core Workout Tips. 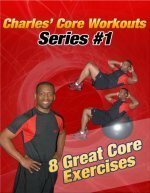 Read my article on Core Exercises for a Better Body or visit the Picture Directory of Core Exercises and Ab Exercises to learn all the core training exercises on this site.